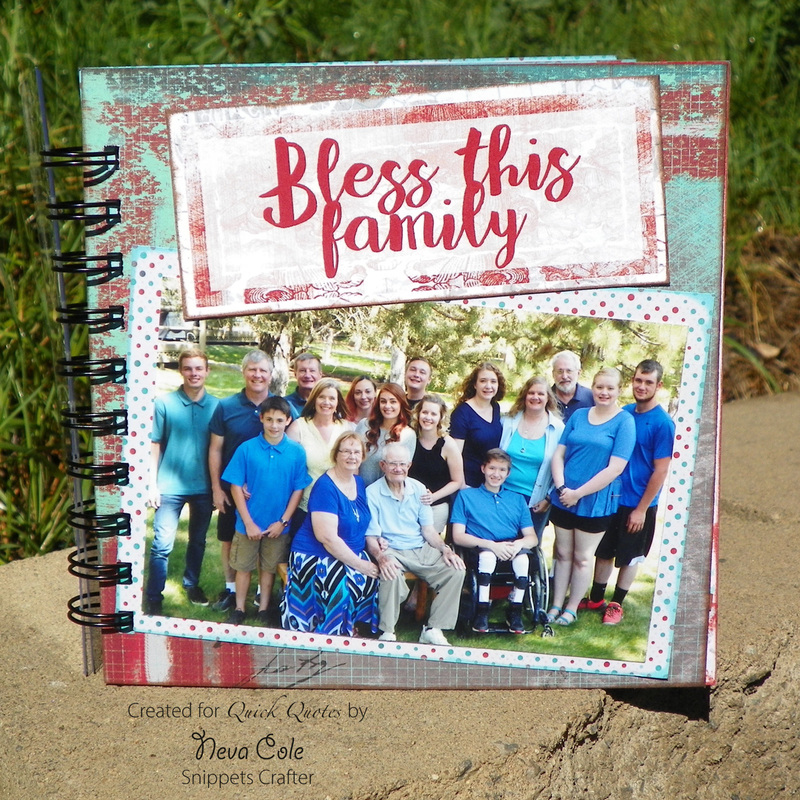 Blog Quick Quotes: Bless This Family with Neva! Bless This Family with Neva! Hello Quick Quote friends! Neva here to share a mini album created using pieces from September's Club Q Kits. 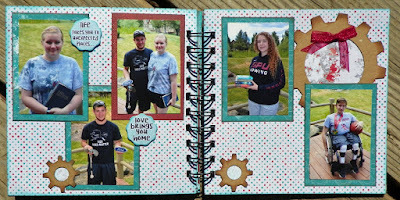 I used all the parts from the Ultimate Combo Club Q to fashion the twelve pages of this 6" x 6" album. Recently I scrapped a few photos from this event, my parent's Sixtieth Anniversary Celebration. My mother's wish for the weekend was to take many family photos and individual photos that showed each family member's personality. With a little perseverance we granted her wish . . . the first round of photos were not of good quality as settings on her camera had been adjusted from auto to manual. But we believe round two of photos turned out even better! 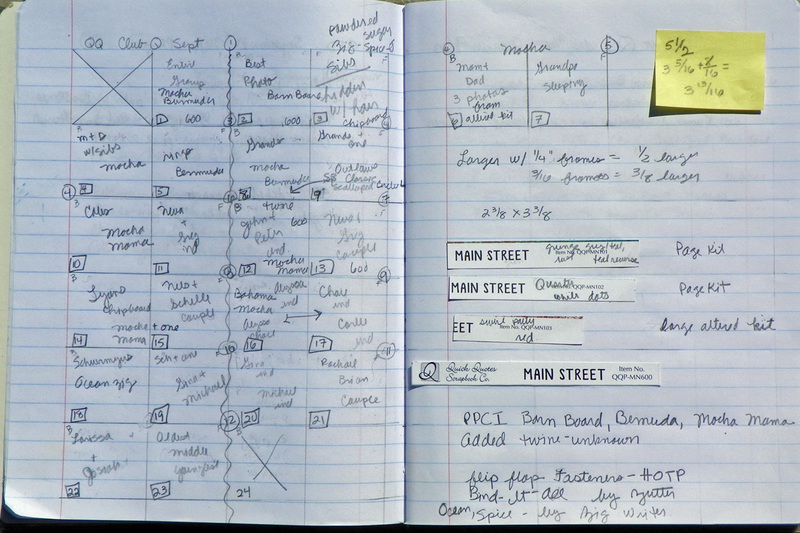 Three sheets from the page kits were used to create the pages, one sheet of Main Street 101 and two sheets of Main Street 102. 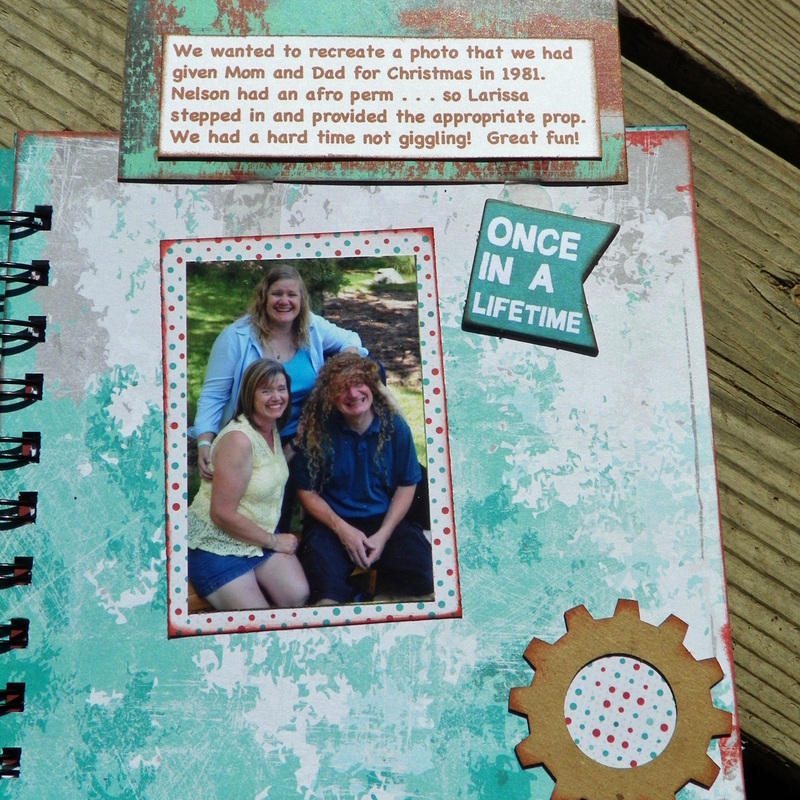 The remaining sheets from the page kits and Altered kit were used to mat the photos. Accents from Main Street 103 were cut from the scraps from the Altered Frame kit. Design Team members were sent Main Street Quotes and Phrases 600 which is used throughout the album including the opening title. 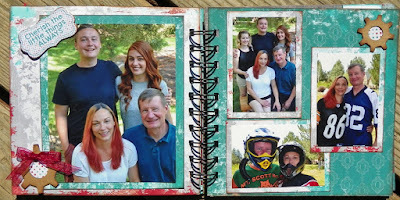 To guide you through the process I used to plan and create this mini album I will share a few insider tips. 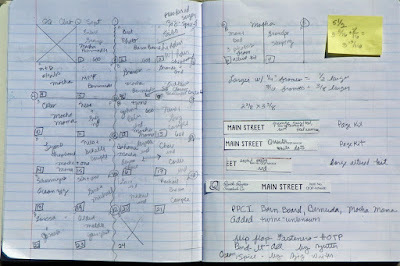 I start with a paper planning grid to determine the sequence and placement of photos. 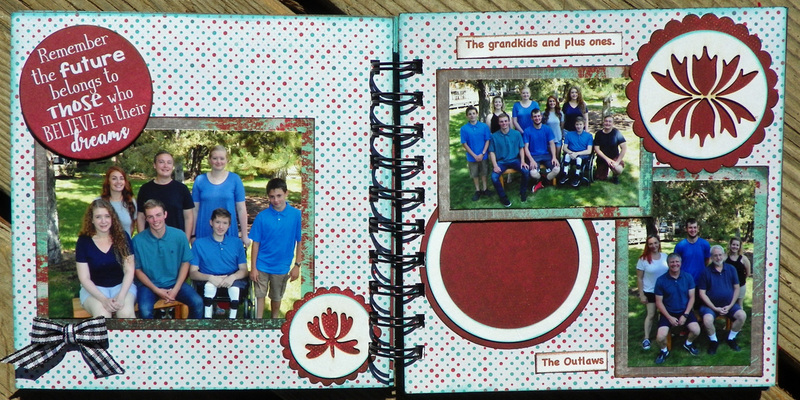 You will notice I added an extra page as I had most of the planning done and wanted to change the order of the photos. 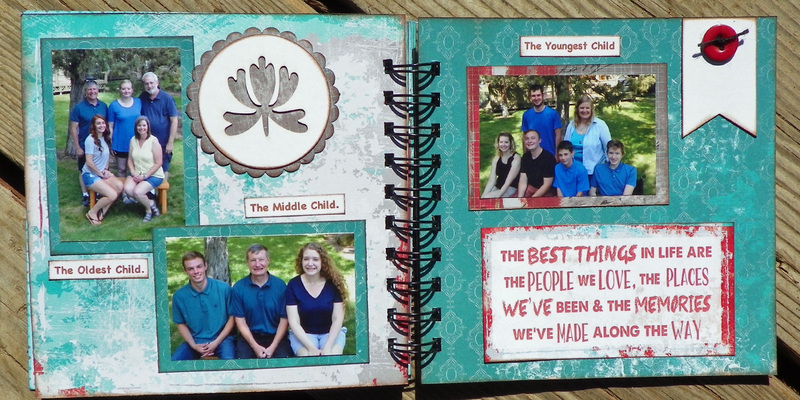 Photos are printed in three sizes: 4" x 6" and trimmed down to varying sizes, 3" x 4", and 2" x 3". 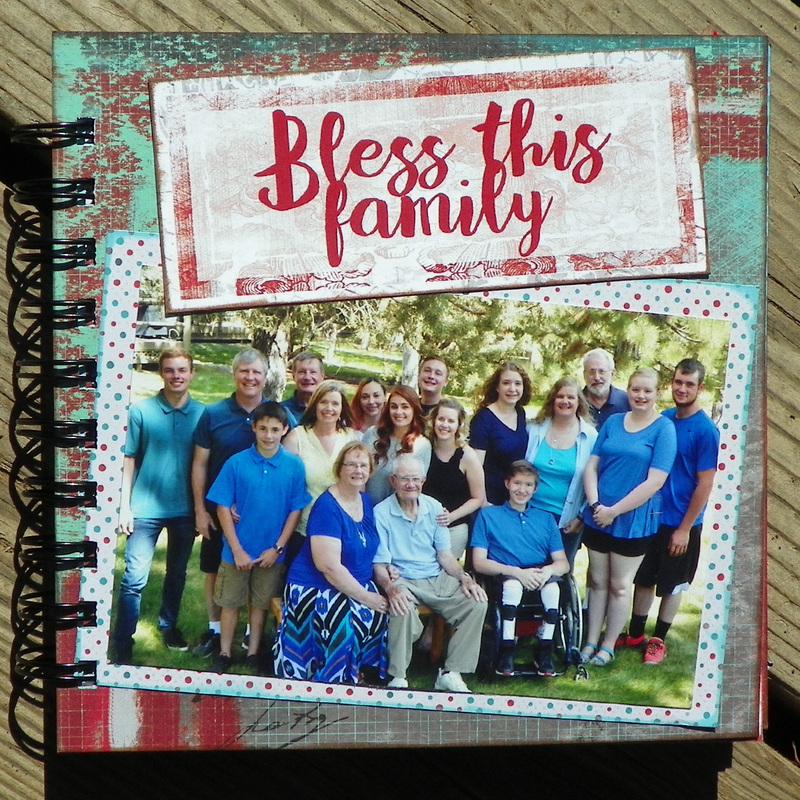 Each of the three sheets are trimmed to four 6" x 6" base pages, for a total of twelve. 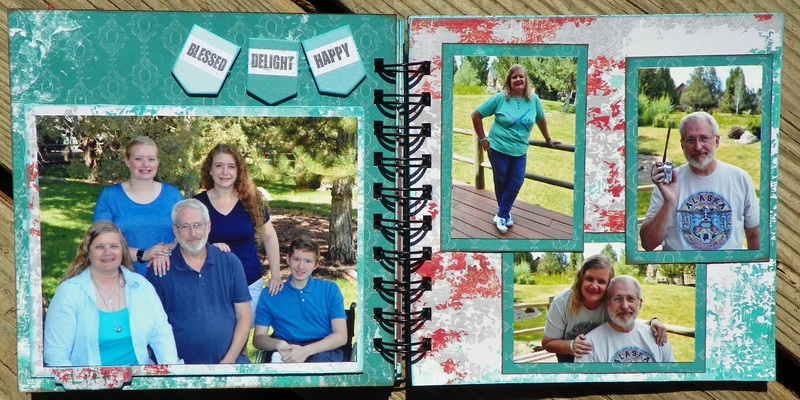 Each 6"x 6" page is laid next to it's companion and the photo mats and embellishments are selected. 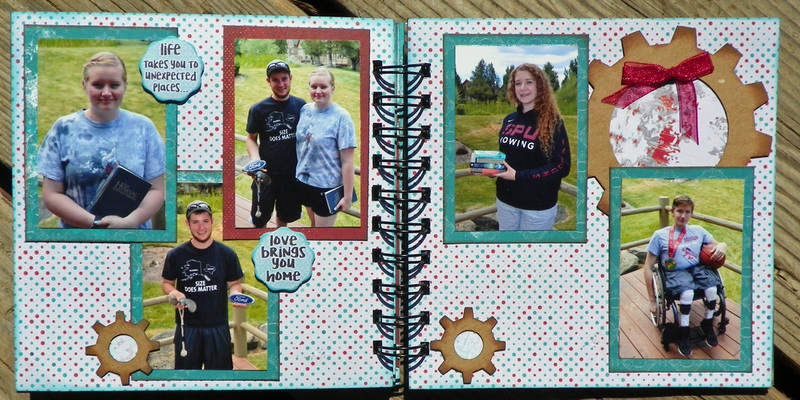 I made an effort to vary the embellishments from the two page kits, the Chipboard Die Cuts, and the Quotes and Phrases, throughout the album. 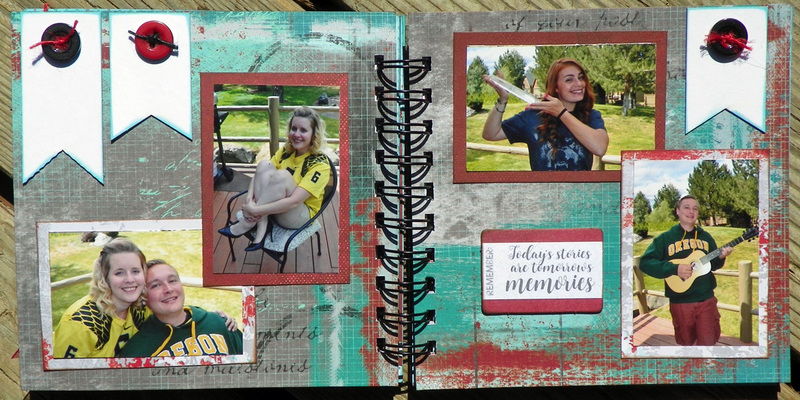 The similarity between the two page kits made this easy, but added a nice variety to each layout. Some companion page backgrounds match, others are complementary. 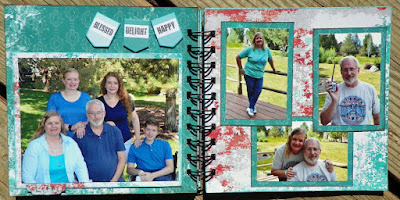 Complementary layouts feature the background on one side and photo mats on the opposite that match. All the elements for each page set are put in envelopes to finalize the design, as a few embellishments were moved around in the mini album before final assembly. The journaling strips were created in a Word document and printed in brown then are inked in Mocha Mama PowderPuff Chalking Ink. Not all are included for publication to protect privacy. Ribbons were tied into bows and added to the pages that needed that last little embellishment. Photo is trimmed to 3 1/4" x 5", and backed with 102 white dots that is 1/4" larger all around for a frame of 3 3/4" x 5 1/2". All of the larger photos have this mat sizing. The mat is inked with Powder Puff Chalking Ink in Bermuda. The 101 grunge side page is inked in Powder Puff Chalking Ink Mocha Mama as is the "Bless this family" sentiment. What a great sentiment from the Main Street Quotes and Pharses 600! 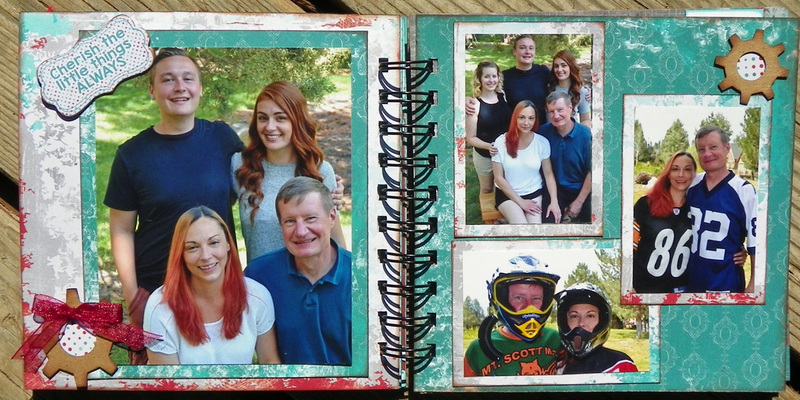 The photo and sentiment are adhered at slight angles to allow both to fit the page with a bit of overlap. 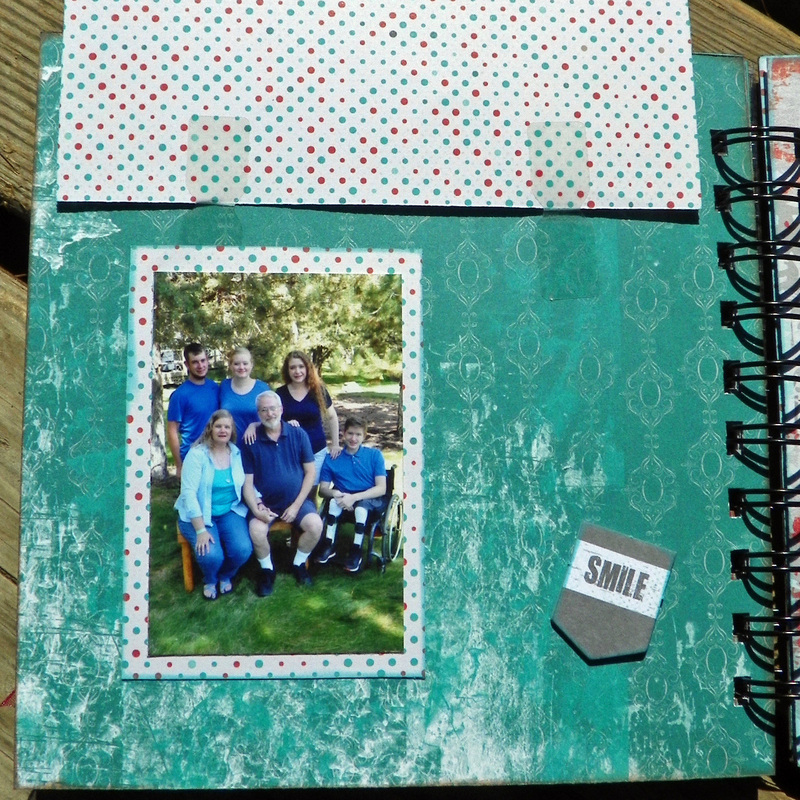 These pages feature my parents and my siblings and uses teal 101 for the left and grunge quarter 102 for the right. The mats are the 102 for the left and 101 for the right to tie the pages together. The accents are used directly from the page kit, along with a bow made from the ribbon from the Small Altered kit. A hidden a flap lifts to reveal a fun photo and story. We had a great time recreating a photo that we gave my parents in 1981 when frizzy perms were a thing for men. My niece crouched behind my brother so her curly hair would give him the illusion of his hair back then. We obviously could not keep a straight face! Barn Board Powder Puff Chalking Ink is used to ink the elements of these pages. With care, one ink color can be used on one side of the page and a different color on the opposite side. 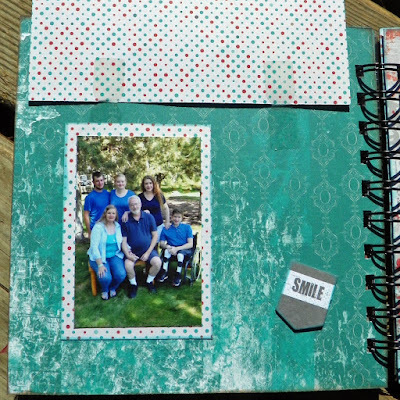 Both sides use dotted 102 for the page and 102 teal side for the mats. The accents are used directly from a page kit, as is the gingham bow. 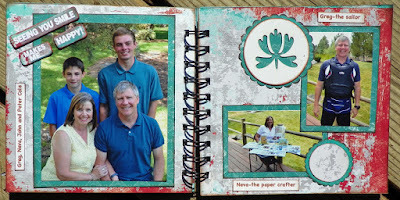 The large circle is trimmed asymmetrically to add interest and tie the two pages together. I also like to think of the symbolism of our wedding rings! Bermuda Powder Puff Chalking Ink is used to ink the elements of these pages. 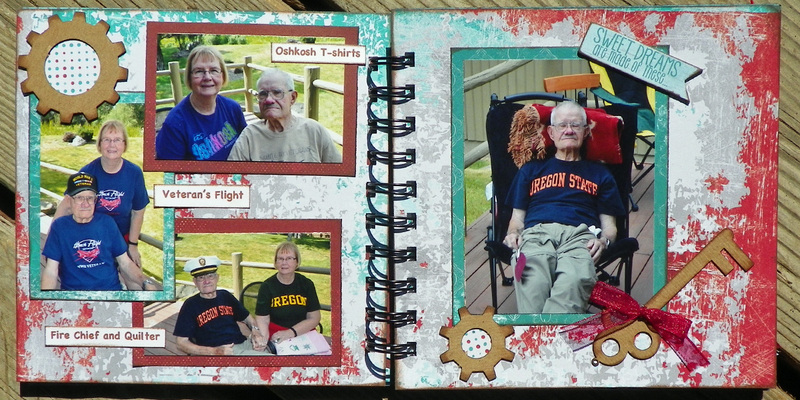 This layout shares a bit of my parent's personality! It features 102 quarter grunge side. The smaller photos are 2" x 3" and the mats are 2 3/8" x 3 3/8". The smaller mats are more proportional to the smaller photos by framing the photo with 3/16" on each edge. 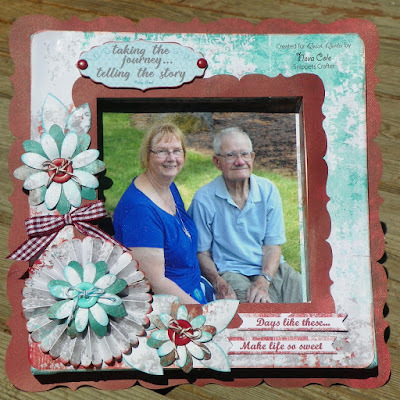 The red mats are trimmed from the scraps of the Altered Frame kit as Main Street 103 is featured as an accent in September's Club Q. The teal mats are 101. Mocha Mama PowderPuff Chalking Ink is used to ink the elements of these pages. There are some really great sentiments in the Main Street Chipboard die cuts that are perfect for layouts about families. This one is fantastic to represent the younger generation of our family! Both Mocha Mama and Bermuda PowderPuff Chalking Ink are used to ink the elements. Pages are 102 dotted and 101 grunge for the mats. 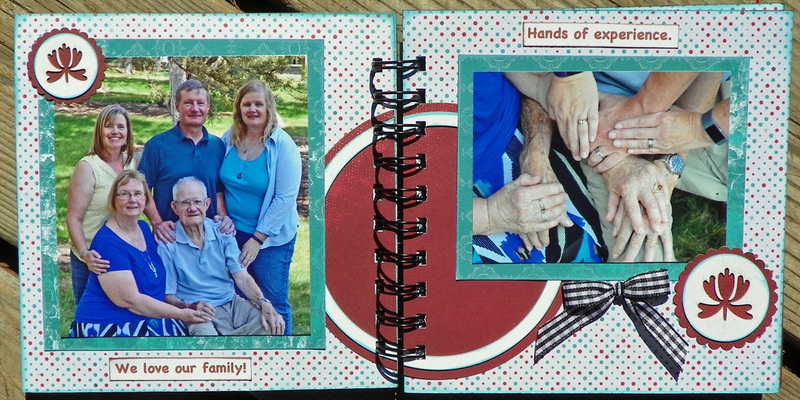 My family is featured in these pages, so the journal strips are included. The background is 102 grunge quarter and the mats are 101 teal. Mocha Mama PowderPuff Chalking Ink is used to ink the elements. Personality photos for my family on 102 dotted pages. The frames area 101 grunge and a scrap of 103 red for the large photo. The banners are trimmed from Main Street Quotes and Phrases and have holes pierced through the corners. Twine is threaded through the banners before the are adhered. 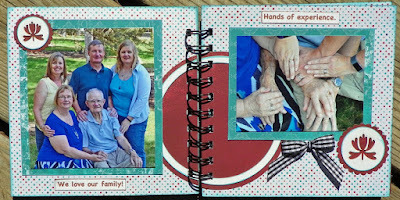 These pages feature my brothers family. 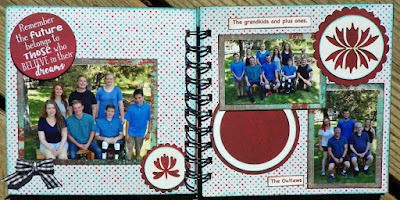 Opposing backgrounds and mats are used in this layout. The quarter grunge of 102 and the teal side of 101. Mocha Mama Powder Puff Chalking Ink is used to ink the elements. I really like how the patterns of the papers show up in the Chipboard Die Cuts! All three embellishments have the dotted side of 102. More photos of my brother's family. Grunge 101 is used for the background. The mats are a mix of 102 quarter grunge and 103 red. I almost forgot to use the great little chipboard banners from the page kits, they finally show up here! They are inked in Bermuda Powder Puff Chalking Ink. Black and red twine are threaded through the buttons before they are adhered. I enjoy adding these little touches to bump up the effect of buttons! 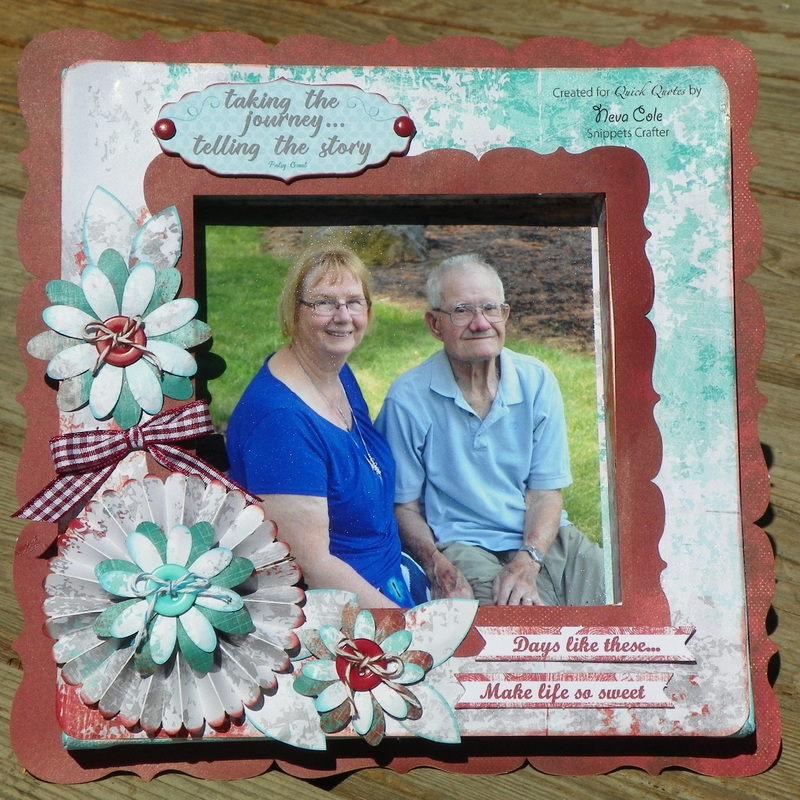 The mats and Chipboard Die Cut are inked in Mocha Mama PowderPuff Chalking Ink. 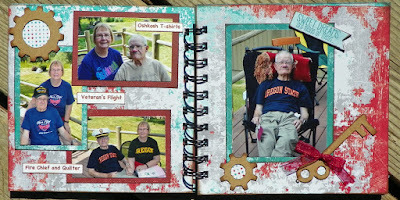 These pages feature my siste's family. These pages are complementary with 101 teal and 102 quarter grunge. Chipboard Die Cuts are the embellishments. Bermuda PowderPuff Chalking Ink is used to ink the elements. More photos of my sister's family. True story about the sentiments selected. My niece moved to a remote town in Alaska with a population of less than 1,500 people to take her first teaching job... and she met her now fiancé! The school district is pleased as they will have a music teacher who stays longer than a year. 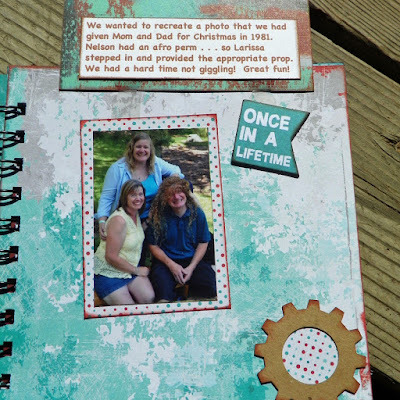 The pages are dotted 102, with mats of teal 101 and red 103. We have a tradition of taking group photos of birth order. 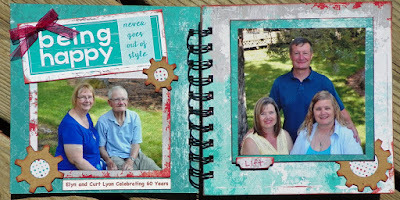 We did it at my Grandparent's 50th Anniversary 30 years ago, and it was fun to take these in August! Quarter grunge 102 and teal 101 are the background, with complementary mats. I used up the last few bits of the pages kits for embellishments, love it when you get to the end of a project and have very little left! 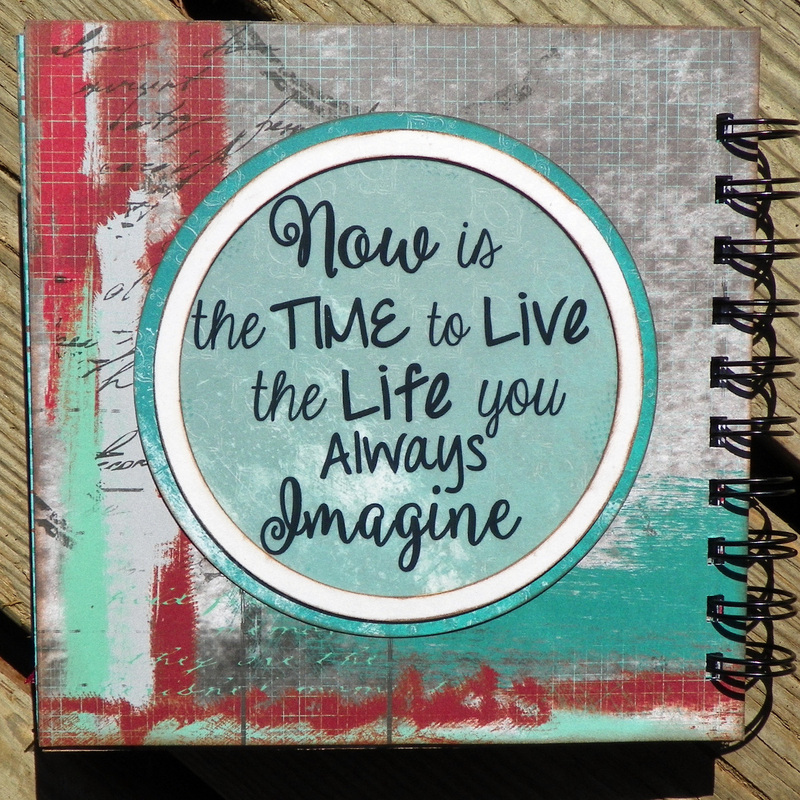 Another great sentiment from Main Street 600 Quotes and Phrases. Grunge 101 with the title from a page kit. I used a Bind-It All tool to punch the holes and bind the mini album together. A similar tool can be used to bind the album. Alternately, the holes can be punch through each page and binder rings can be used to finish the album. Because the pages are smaller and are not placed in page protectors, I choose to adhere the Chipboard Die Cuts with additional glue dots to insure they would stay put! 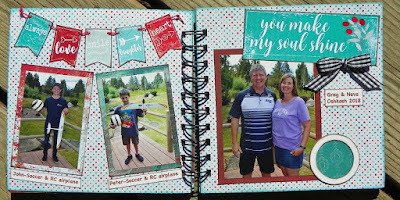 Making mini albums is a passion of mine, and I am thankful that the elements of the Ultimate Club Q Kit worked so well together to create a cohesive but fun mini album. Thinking outside the of the kit can be really fun and a satisfying crafting experience. Here is my version of the Large Altered Kit, I always really enjoy making a Quick Quotes Canvas! They always turn out so beautifully! I used a different Main Street Chipboard Die Cut, and punched holes to insert the brads. Shhhhh, this will be a gift for my parents! Thanks for stopping by Quick Quotes today!